Consider choosing the services of our roof cleaners and receive proper, high quality office or house roof cleaning. The cleaners work with pressure washing equipment to rip out algae, mildew, mould, lichen from roofs. All our services are wholly covered with insurance. You will boost the look of your residence and will secure your roof from just about any ruin which can occur due to debris and other residues amassed on it. The cleaners can use only water, and environmentally friendly and completely safe cleaning solutions. Gutter cleaning is a preventive measure which every property owner must take to prevent the clogging of the downpipes and gutters, because this could result in serious water damage to the building. 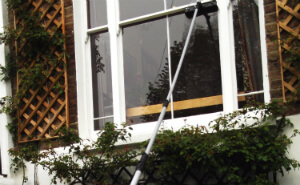 Our gutter cleaners use dry or wet vacuum cleaners and telescopic poles with cameras to locate and clean out all of the twigs, leaves and other debris. They will make sure that they get your gutters clean and will show you pictures of their condition prior to and after the cleaning. Ashlee House Cleaning offers a 30 day service quality guarantee. A team of gutter cleaners will re-clean if your gutters get clogged in the 30 days following the service. Because we care about our clients, we have tailored a very refined and easy booking system for our window cleaning Cromwell Road SW5 and for our various other services. You may get a free price offer or make an appointment with our expert window cleaners by simply calling 020 3746 1366 or filling out the online reservations request form. The client support team is readily available 24/7. You will get an e-mail and a text message confirming your reservation in just two hours of your request. Pick just about any day of the year for making your reservation with us. We have fair rates. No deposit is required for scheduling this service. If you are booking early on or are a regular customer, we will offer you our advantageous price for this particular and various other services. Estate agencies and property managers also get great price offers. Make sure you leave it to our professional cleaners to efficiently clean your windows, roof or gutters - get our high quality cleaning service now!